Ansco, No3 Vest Pocket Junior, c1923. Photograph gallery. I wasn't expecting much from the Ansco, this was about the best I could get from it sadly. It's main problem, apart from a persistent light leak, is camera shake from the very harsh break off point on the Wollensak self energising shutter. 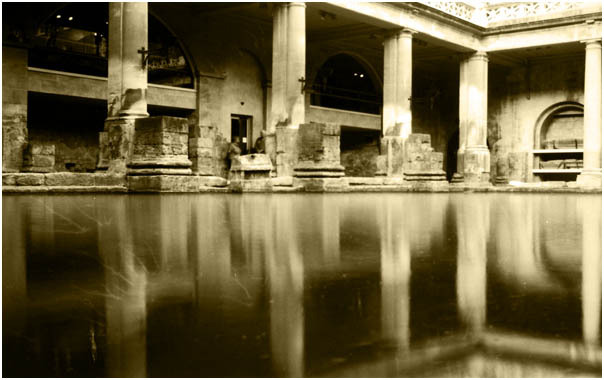 This image is of the Roman baths in Bath, UK. The large angular pillar pedestals are the original Roman. The water is hot from a natural spring to this day. This image was made using the Ansco's built in prop leg, it was almost in the water and the expsure was nearly two seconds. The rest of the roll really wasn't worth bothering with! This Roman complex is quite extensive, even though only a small part is excavated, well worth a visit and on a cold day a mist hangs over the warm pool.